In our previous instalments we discussed the preparation of a business case and calculation of the data needed to prove it. Today we will be discussing the art of delivering the business case in such a way that it competes on a level playing field with all other initiatives currently on the agenda. The first paragraph should always be entitled ‘Executive Summary’, but it should be the last one written. The next paragraph should be a backgrounder that demonstrates succinctly and understanding of the operating environment, I.E. political, environmental, social, technological. Make sure you don’t fall into the trap of contradicting the CEO. Work form the five year plan or current year plan or what ever is the most relevant document and if there have been significant changes in the operating environment since it was written then discuss it with senior people so that you reflect it accurately and delicately. You may find for example that the CEO published a plan for robust growth ina bullish market three years ago and the CFO is now investing inwardly in cost avoidance projects while they watch the news with interest for an indication of the way forward. In this case you need to be able to reflect this in your businss case so that it sets the scene for your cost reduction proposal. When it comes to writing down your propositions, bear in mind that there will be two distinct audiences, those who want to scrutinise the details and those who want the bottom line only. The latter type will very often be relying on the former to take care for the detail for them so it is very important that you address each in the appropriate manner, presentation and language. In part two we drew a map that linked features to benefits. In this section we will expand this idea further and we will map those benefits to stakeholder driven propositions. Here is a simple example from my own experience. In the diagram above we can clearly see that the CEO has published a key goal for the current period which is to improve net profit margins by 1 %. 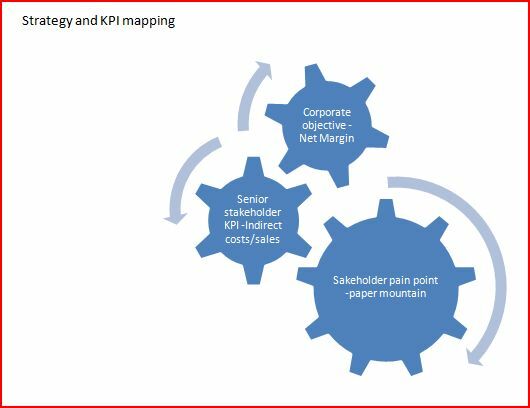 The CFO has a related KPI called indirect costs/sales volume and he is hell bent on improving this KPI by 1 point in order to meet the CEOs goal. 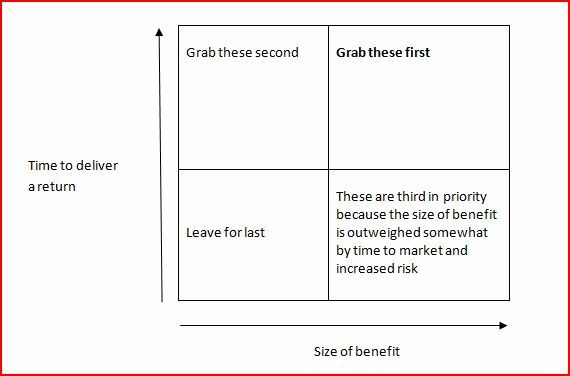 In your business case the value propositions would address each of these stakeholders in his/her own terms and use context to draw an accurate picture of the scale of benefits. The proposed system will positively increase net profit margins by a factor between .2 and .4% in it’s first year of operation and reach break even in the first quarter of year 2. In achieving this, it will increase the costs/sales volume KPI by a factor of around .3 through virtually eliminating the paperwork involved in the picking, packing and shipping aspect of operations. Additional benefits will be reduced propensity for error in this area that we have not attempted to quantify. For detailed breakdown, see the financial analysis section. You will note that this sentence describes the system in terms of benefits that can be readily understood and appreciated by each individual stakeholder. By quoting KPIs the scale of the benefit is immediately put into context so that you capture the attention of your target readers. You don’t need to be a financial analyst to figure out that bringing in benefits early has a dramatic affect on the financial results of your project. If you cast your mind back to part three when we talked about Net Present Value (NPV), you will realise that bringing in, or saving a million next year rather than the following year, supposing a discount rate of 10% will deliver an extra 100,000 in benefits. Not only that but it reduces the total investment required, thus improving ROI and freeing up capital for other important projects. This simple exercise will help you optimise your business case by bringing forward benefits where it can be done. You may remember that in part one we talked about listing the features and benefits that make up your projects and creating metrics for each feature. Here is a simple tool we use to prioritise these features. If you need to analyse more complex and more data rich cases, then a Pareto chart can be an excellent way to single out the low hanging fruit. For non financially aware people you may be able to put the benefits in context by taking the ROI and calculating how much extra revenue it would take in order for the business to deliver that same return through extra revenue generation. In order to make this case rock solid you need to also present at least one potential alternative tactical solution and a do nothing scenario. In your final analysis, you will compare the do nothing scenario, the tactical solution and the proposed solution and demonstrate clearly the basis for your proposal. An indicative project plan should be included in order to demonstrate the likely timelines including benefits realisation activities, implications for personnel, budget and team structure. 1. Our proposal, stated in direct no nonsense language aimed at all relevant stakeholders just as we discussed earlier. 2. Our paragraph of analysis that briefly describes the alternatives and the rationale behind our proposal. The executive summary should contain nothing but the bare facts and concise value propositions, no rambling intros or winding up paragraphs. It is a business document and it is about cold hard cash so keep it clean and factual and get straight to the point. Don’t forget a sign-off sheet so that they are very clear of the immediacy and urgency and the fact they will be expected to make decisions as opposed to having a discussion. In order to present the business case, our strong recommendation is that you produce three artefacts. 3. A presentation of four or five slides demonstrating pictorially, the background, the benefits, the financial analysis, the project outline. The first communication should be the short summary sent by email to the stakeholder list along with an invite to discuss it in a formal setting. The second communication should be a presentation of the business case with opportunities for questions and answers and the full business case handed out about half way through the presentation once the key points have been presented. I searched around for useful tips on developing a business case and this series of blogs is by far the best thing I could find. I don’t think I could present intangible benefits to my sponsor and ask for a cheque, though I do agree in principal.